The Cyclades-TS family of Console Servers provides you secure and reliable management of your network and servers from anywhere in the world. Available in many different port count models in a 1U form factor, the Cyclades TS3000 (TES0090). 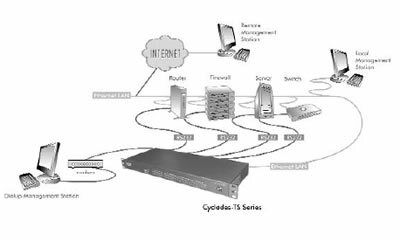 The Cyclades TS3000 (TES0090) console management features such as data buffering, direct access methods to the serial ports (such as TCP port and server name) and event notification improve monitoring capabilities, allowing faster problem solving actions and higher network uptime. Instead of using proprietary software technologies, the Cyclades TS3000 (TES0090) leverages on Open Source software (Linux), giving users the freedom to customize its operation, modifying or adding features as needed. The Cyclades-TS family of Console Servers decreases network maintenance costs while increasing efficiency and productivity. That's why the Cyclades TS3000 (TES0090) is the right choice for secure in-band and out-of-band data center management. Question: Hi there, I would like to know if the facilities connection of TES 0090 are the same available in TS 3000 (We can assume that the pinouts at Cyclades TES0090 ports are the same as for the older models, standard for RS232 on RJ45 connectors)?. Answer: Thank you for your inquiry. It is our understanding that the discontinued TES0090 and the TS3000 are the same model. Looking through the TS manual, it does appear that all Cyclades-TS Console Access and Terminal Servers use the same pin out. Detailed pin-out information can be found in Appendix B of the user guide, which can be downloaded here: http://www.42u.com/pdf/cyclades-ts140_manual.pdf.